Bending your arms on the way through can cause frequent contact problems. 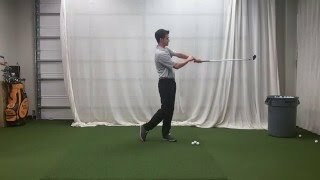 If you struggle with fat and thin shots then you may need to work on your arm extension. When you work on your arm extension, make sure that you don't lock your elbows to your sides. It's better to strive for stability in the shoulders, rather than the elbows. Arm Extension - Timing And Direction The arms and the body have separate, but related jobs. Understanding The Chicken Wing The chicken wing is an often misunderstood swing fault. Learn what really causes it in this video. Band Presses - Arm Extension To Follow Through A simple drill for getting a feeling of the arm extension during the release.